Often, for me, the measure of a good cookbook is in the success of the very first recipe that I attempt from it. If it emerges a raving success, I gleefully congratulate myself on money well spent and bring out the Post-It stickies to flag yet other recipes I'd like to try. By that merit alone, one of my latest purchases, Alice Medrich's Bittersweet, was a tremendous hit. Because my schedule of late hasn't really permitted me to do much in the kitchen other than boil water for pasta or make scrambled eggs, I was looking for something simple yet satisfying. Sweets for the stressed, is what I like to call the fat food that my colleagues and I munch helplessly at our desks during the last month of every quarter when impossible deadlines and printing schedules collide. 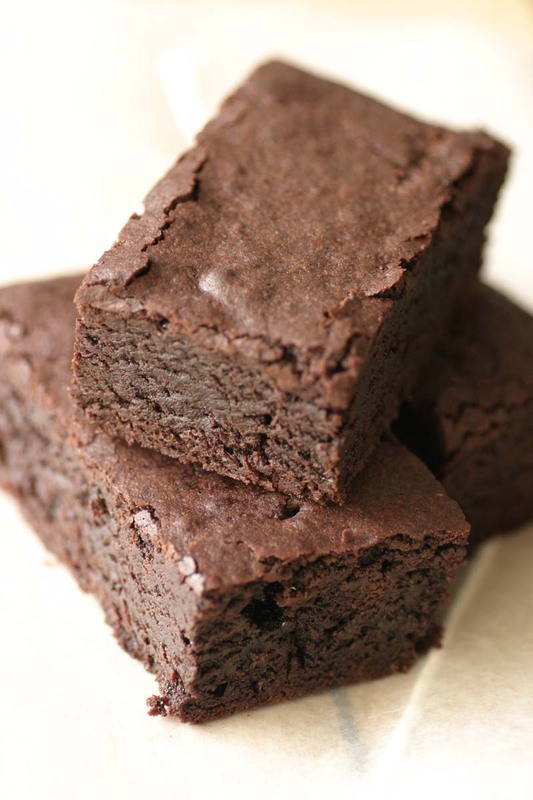 These moist, chewy, dark as midnight brownies were everything that Ms Medrich promised. There is not a drop of real chocolate in it, but the three-quarter cup plus two tablespoons of the best Dutch-processed cocoa made these intensely chocolately, and received an A for both taste and texture. They are, as they have been named by the author, The Best Cocoa Brownies ever. I can't wait to try more of her recipes. those look great. too tempting though! the first few months I got the book, I went to bed with it... and most of the time the result - I am just too greedy, I confess - to stop and arrange for lightings and camera so I haven't blogged anything about my adventures with my Medrich :P your brownies look awesome! oh wow, this just looks so heavenly. I would be licking the screen right now if it weren't for fear of being caught! looks yummy, i think i'll hv to get the book, unless u're willing to share the recipe ? eggy, that looks great! I'm going to give that a try since it was a toss between her cocoa or her bittersweet version with that plunge in ice bath method. Thxs for inspiring me, hope mine turn out well as I had a dismal brownie tryout tday.